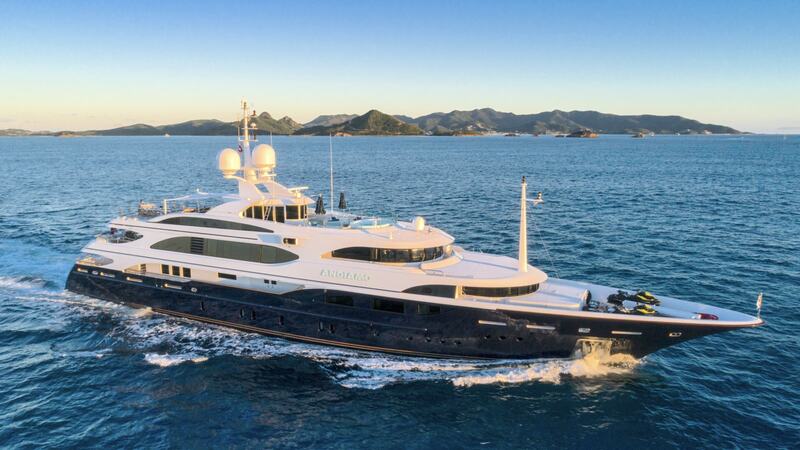 Andiamo is a fabulous 6 stateroom yacht and a well-known player in the international luxury charter market. She was built in 2009 and had a major interior refit in Spring 2017 along with a new dark blue hull. With classic exterior styling by Benetti and her new chic interior by Patrick Knowles Designs, Andiamo is a highly sought after choice for luxury charter. Andiamo has one of the industry’s most experienced crews and an award winning chef! The impressive sun deck boasts an air conditioned gym equipped with treadmill, spinning bike, rowing machine, free weights. Bask in the sun on the expansive sun pads or enjoy a relaxing massage by the onboard masseuse. Other special features include an elevator servicing all decks and a large beach club with sauna. Andiamo will leave you in awe! Andiamo (ex Lady Luck) was built in 2009 and completed a major interior refit by Patrick Knowles Designs in Spring 2017. Her hull has been painted a distinctive dark blue. This fabulous 6 stateroom Benetti was designed with sophisticated entertaining in mind. Light satin-finished wood and over-sized windows are found throughout the interior. The grand foyer, with its lustrous white marble floor, features a circular glass elevator to all decks and a graceful spiral staircase. The inviting open plan main salon / formal dining area flows to the large aft deck with a large U-shaped leather sofa. Forward on the main deck is the striking full-width master suite with a king bed. The private office is found at the entrance to the suite. His/hers bathrooms are located either side of the steps to the raised private observation lounge forward. The deluxe VIP queen stateroom is situated on the bridge deck and 4 beautifully-appointed staterooms are situated below: 3 queen and 1 twin. Delight in alfresco dining on the sky lounge aft deck and on the sundeck. The plush sky lounge offers conversation areas port and starboard along with a bar and a game table aft. The expansive sundeck offers 3 separate entertaining areas. The raised foredeck is furnished with a large Jacuzzi and sun beds; the raised lounge area is located aft. In the center is a dining table for 12, the elevator and the glass-walled gym with air-conditioning. Optional shade awnings are available for all three areas. The yacht’s beach club in the stern includes a 2 person sauna. Andiamo tows a new 11.27m / 37′ Intrepid center console tender (3×300 hp) fully-rigged for fishing and she carries a wide assortment of watersports equipment.